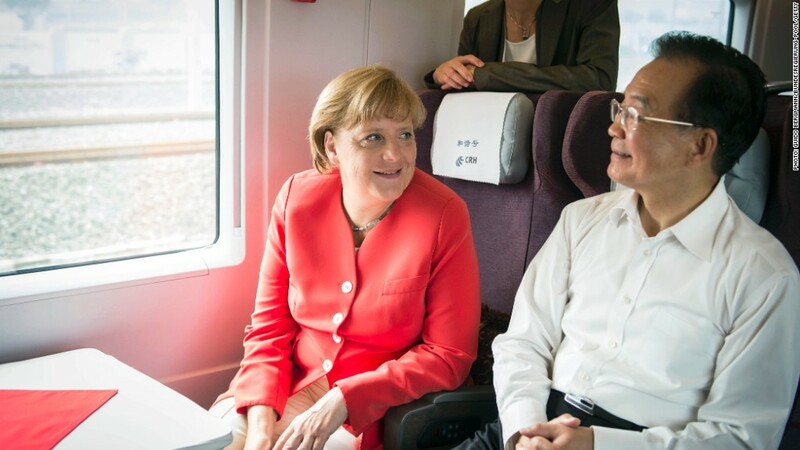 German Chancellor Angela Merkel and the Chinese Premier Wen Jiabao travel on a high-speed train from Beijing to Tianjin. Activity in China's manufacturing sector slowed dramatically in August -- and weak demand in Europe, its largest trading partner, is at least partially to blame. Two key reports -- one from HSBC, and one from China's government -- showed manufacturing activity in China slowed to a nine-month low in August, all but erasing hopes that China's economy would mount a robust comeback this quarter. China -- the world's top exporter -- has dramatically increased trade with the European Union in recent years. The EU is now the top destination for China's exports, according to the European Commission, which calls China "the single most important challenge for EU trade policy." Trade flows the other way, too. Total trade between Germany and China hit $144 billion euros in 2011 -- up 11% from the prior year. A trip to China last week by German Chancellor Angela Merkel underscored the relationship's importance. Merkel toured an Airbus plant in Tianjin. And she worked to mediate a dispute between China and the European Commission over solar panels, an episode that could have broader implications if retaliatory actions are taken. "Protectionism cannot be the right response," Merkel said. "Current problems in the field of solar energy too should be resolved around a table and not in front of a court." The close trading relationship between the EU and China is key, especially as global trade growth declines. The World Trade Organization expects that global trade growth will decelerate to 3.7% in 2012, down from 5% the previous year. "More than three years have passed since the trade collapse of 2008-09, but the world economy and trade remain fragile," WTO Director General Pascal Lamy said in April. "We are not yet out of the woods." China officials will likely be keeping a close eye on Europe this week in particular. On Thursday, ECB President Mario Draghi is widely expected to unveil details of a new bond-buying program for eurozone governments that agree to certain conditions. The plan could help China's manufacturers should demand for Chinese goods increase in Europe. And the onslaught of weak data could add further pressure on Chinese government authorities to take steps to reverse the slowdown. Manufacturing in China accounts for around 50% of the economy. The country's central bank has already moved to cut rates twice this year in an effort to boost the economy. The actions -- performed in June and July -- were the first rate cuts since 2008. The government has pursued other stimulus measures -- an easing of capital requirements, and an infusion of cash for local development projects -- to bolster the efforts. Still, Chinese officials may defer action pending more economic data, or the completion of the country's historic leadership transfer later this year.